The Singingbelt System provides a comprehensive foundation for healthy and efficient singing that begins and ends with a focus on the breath. Singingbelt System vocal coaches are trained to teach all ages and all vocal styles. Singingbelt System certification also includes training in the “Sing Better In A Day!” workshop. For newer vocal coaches or more experienced vocal coaches who have moved to a new area, the “Sing Better In A Day!” workshop offers a gateway to developing a thriving clientele. 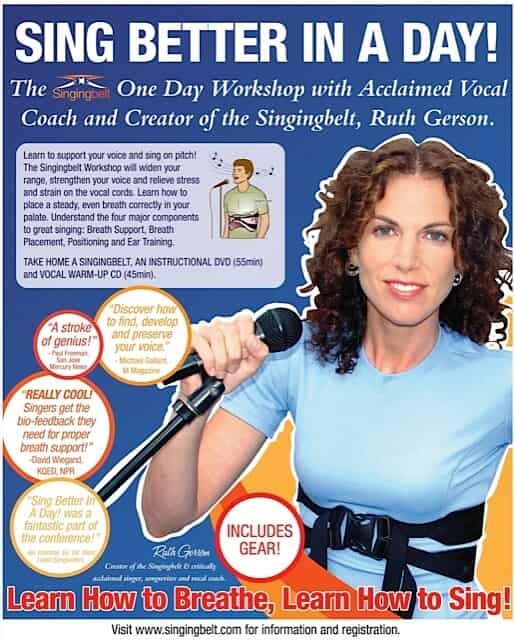 Certification is intensive, private training with Singingbelt System developer, Ruth Gerson. Training also requires Singingbelt System certified coaches to observe, based on previous experience, twenty to fifty hours of private voice sessions via video conferencing. Email info@singingbelt.com for a Singingbelt System Certification Application. Please, include your name, contact information, previous vocal music experience and education, and 3-5 links to vocal performances.